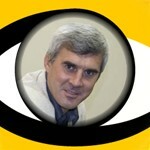 The #1 Smart Executive site on the web – as ranked by Google and Yahoo! Most people and businesses use less than 1% of their true potential. Learn how to build a great company and unlock true potential of your people! We don't teach – we inspire you to come up with innovative winning solutions! The World's #1 in Business e-Coaching! The most trusted source of inspiration, innovation, and unlimited growth! ► Today, we have customers in 100+ countries! 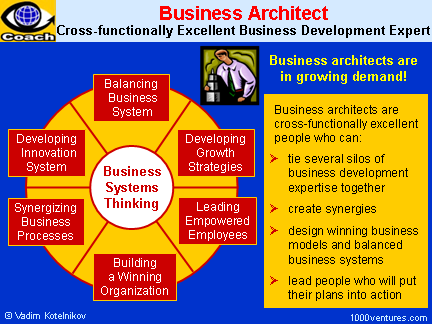 "Smart Executive", "Corporate Leader", "Business Architect"
out of about 50-million-wide (!!!) competition! Global bestseller! We are proud to have customers in 40+ countries: Australia, Belgium, Canada, China, Costa Rica, Croatia, Cyprus, Czech Republic, Denmark, Ecuador, Egypt, Finland, France, Germany, Greece, India, Indonesia, Ireland, Italy, Kenya, Kuwait, Malaysia, Netherlands, Norway, Oman, Qatar, Pakistan, Peru, Republic of Korea, Russia, Spain, Saudi Arabia, Singapore, South Africa, Switzerland, Taiwan, Thailand, United Kingdom, United States, Venezuela, Vietnam, and Yemen. Start a business when you have a passion for something and want to create something that you can be proud of. Inspire your people with a clear vision. Define shared values and let values rule. 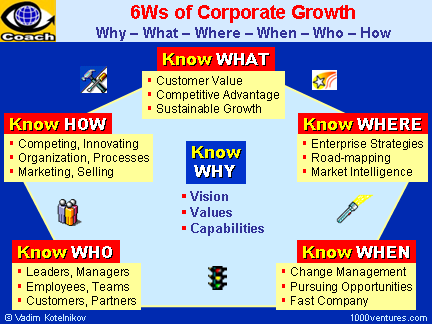 Build your distinctive corporate capabilities to achieve competitive advantage. 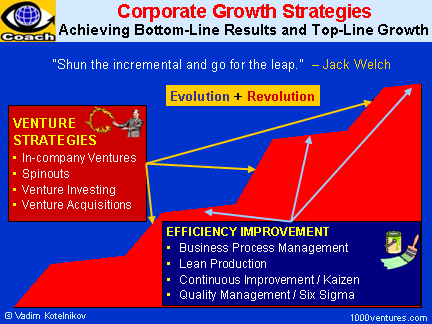 "In the end, all management can be reduced to three words: people, product, and profits. 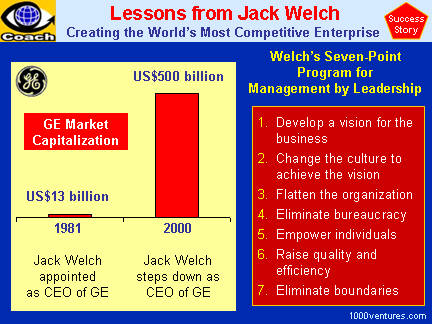 People come first," said Lee Iacocca Your corporate vision is worthless, strategies powerless and shared values are corrupt without the right people to execute. Manage processes, not people. Focus not on what they do, but on how they do it. Establish a synergistic enterprise-wide and an end-to-end (cross-departmental, and often, cross-company) coordination of work activities that create and deliver ultimate value to customers. Revolutionary Ten3 SMART Learning – without forgetting! Learn & Teach – fast! ► Buy now! 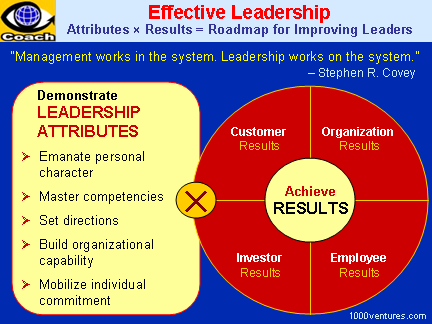 Buy it today and start your leadership training program tomorrow! Do you want to turn all your people into innovative leaders? 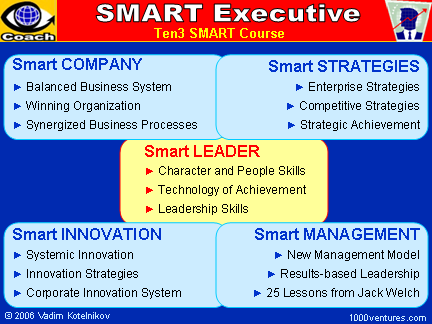 Buy Ten3 Mini-course "SMART Executive"with a Corporate License! The Corporate License allows you to install the product on Intranet, on unlimited count of PCs within your firm, and make unlimited number of printed copies of the mini-course for internal use. Don't "sit" on your dreams – start making them a reality NOW! Invest in yourself and your unlimited growth! "Control your destiny, or someone else will." Ten3 Smart Learning: Fast inspirational learning – without forgetting! Smart Course Materials give you the most knowledge and take from you the least time. License to use the PowerPoint slides for teaching purposes – Learn & Teach!